The KB ZIS BTR-152A is a Rank II Soviet Self-Propelled Anti-Aircraft gun with a battle rating of 3.0 (AB/RB/SB). It was introduced in Update 1.71 "New E.R.A". As with any APC, it features light armour on a spacey vehicle, a good crew count, a decent gun and good mobility. 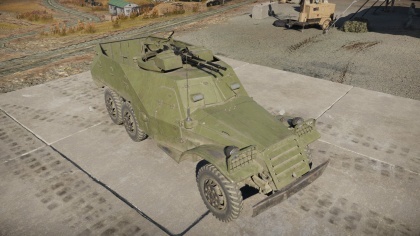 Since there is no infantry to fight, the BTR is used as an AA in-game. The BTR-152 is an APC (Armored Personnel Carrier) on a six-wheeled, open-topped truck chassis, meaning unlike the Soviet truck-mounted AA vehicles, it can survive low-caliber MG fire from ground vehicles. However, anything above 30 caliber doesn't have much trouble taking this vehicle down. It features a top-mounted twin KPVT gun mount with good traverse and elevation rate. Something to note is the presence of the two spare loaders in the back. Inexperienced players, or those who don't know the structure of the BTR-152A, tend to repeatedly shoot the cab of the truck, leaving these two crewmembers relatively unharmed. While armour is nothing impressive for any BR, it is in no way rubbish or useless since it protects the crew from most light ground menaces such as MG fire, most indirect artillery shrapnel, low-caliber HE shells and even some medium-range HMG fire. These light plates have some chances not to detonate incoming APHE rounds, virtually turning them into pure AP shells. To maximize this effect, one should never face tanks up front. It is recommended to always show side armour if fired at, as from the side, modules are quite spaced out. Avoid autocannons at all costs since any of them can shred this APC in no time from almost any angle. Anyways, in most scenarios, it is better recommended to just hit the gaz and avoid any incoming shots/artillery fire. Here is an interesting feature that can provide any wise commander with a few kills: BTR-152A's speed. This light APC can carry itself over the road at breakneck speeds, provided it can ride a paved road. In good circumstances, it can reach over 80km/h and keep its good speed even while turning, due to its wheeled chassis. Offroad mobility is not bad, meaning it can easily follow medium and light tanks on any terrain, making for an effective flanker. Backwards, speed tops at -20 km/h, which is enough to get out of an ugly situation if needed. With its large wheels, this truck can cross some small trenches and rivers, where its GAZ and ZIS truck counterparts would ditch. This truck's centre of mass is quite low, allowing it to turn at high speeds without rolling. 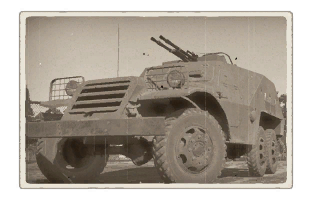 This is where this truck shines over its predecessor and followers: it has a higher rate of fire and more ammunition while retaining a good armour penetration and having a fully rotating turret (where the 72-K trucks are unable fire directly in front). Each ammo loadout can effectively engage tanks' sides with relative ease (at close range) and easily shred even heavy planes. The guns can fire for 10 seconds before overheating, or ~150 bullets, half of their magazine. Universal AP-I, API-T, IAI This is the default belt in usage up until unlocking the API-T belt. It can effectively engage both tanks and planes but is not as good against tanks as the API-T belt. IAI IAI, API-T Specific belt for hunting planes 1/2 of this belt is IAI ammo, which has no penetration but sets fires to planes quite easily. In emergency situations, can be used against tanks. Ammo racks of the BTR-152A. As an AA vehicle, this thing is deadly to CAS that gets close. The MGs have good RPM and a good spread which is important in AA. As long as you lead correctly this vehicle can be used to shield you from 250 lbs - 1,000 lbs from the Allied aircraft or the 500 kgs from the Germans. If down-tiered, it should do alright against most tanks as it has quite good penetration, but if up-tiered, you need to get on the sides or rear of most tanks. Stick close to the middle of the pack, but not too close to anyone to avoid becoming too obvious a target for tanks or aircraft. It is a good idea to stay close to the front lines, to help protect against aircraft and spot enemy tanks. It does have somewhat poor ammo capacity, so one might benefit from staying on a point to reload while swatting planes out of the sky. This vehicle can easily be used as a frontline AA and skilled players can even flank with such a truck. Stick to allies and watch the skies. Team play is key with this SPAA since it cannot effectively destroy most ground targets from the front; it will often have to rely on ally firepower. When the battle gets hot, do not hesitate to hit the gas and reach cover while keeping an eye on the sky. Watch out for fighters since they will try to strafe this juicy open-topped target. Loading the API-T belt is recommended, as it can engage both tanks and planes (both of them can appear in sight at any moment). Be sneaky. Any tank can end this truck (or at least critically damage it) at any range. Use the road to maximize mobility and strike quickly. Take out tanks by their sides, empty your magazines and retreat to cover, and make sure to not stay in the same spot for too long. If the enemy knows your presence (turret turned towards you), abort flanking manoeuvres and return to the safety of the team. Good rate of fire (effective AA). All ammo loads contains AP shells with at least 25 mm of penetration. Elevation of 89° and 360° rotating turret means no AA blind spot. Small turret and high mounted guns make hull-down position extremely effective. Can fire a whole 10s before weapons jams due to heat. Huge magazines, reloading is rare. Huge ammo load means it is not likely to go dry. Fast turret traverse and elevation. AP rounds lose a lot of penetration between 100 and 500 m.
If firing continuously, can only fire half of its mag before having to unjam weapons. Open-topped, fears strafing planes and artillery. Vulnerable to HMG and autocannons.